Crepes is one of those words that I rarely say correctly. Though I know it is pronounced "krep," rhyming with "step," and the plural "s" is silent, I usually just say "crapes" because that's what most American ears are used to. But however you say it, they are delicious! Does anyone remember The Magic Pan restaurant chain popular in the 80s? My friends and I simply had to stop in there every time we hit the mall. I was especially fond of their chicken divan crepes. Can't recall my favorite dessert crepes. I recently received a bottle of Castello di Amorosa Moscato Il Raggio del Sole, and I immediately thought something peachy would pair perfectly with a 4-ounce pour of this lightly sweet dessert wine. Then I thought of crepes. It's been too long since I last made crepes, so I dug out my recipe and wondered how many "test" crepes I'd have to make before I got the hang of it again! Turns out, none! Which only goes to show that making crepes is like riding a bicycle. Once you get the hang of it, you never lose it. The key is mastering "The Swirl," described below in the directions. I think I actually begin the swirl before all the batter is even out of the measuring cup and into the pan. Speaking of the pan: Maybe it's one of those anti-everything all-natural organic old hippie chick things, but I'm not crazy about (translation: I hate) nonstick pans. But ... 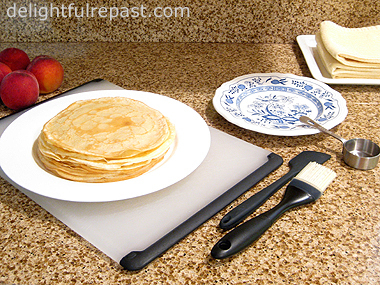 I do have one nonstick pan in my cupboard -- an 8-inch nonstick omelette pan that I use just for omelettes and crepes. The recipe makes 18 crepes. Even if you don't need that many right now, make the whole amount. Having a stash on hand -- for a few days in the fridge or a couple months in the freezer -- will mean you can turn out a "fancy" dessert in minutes on very short notice. Do you like to make crepes? Sweet or savory? Tell me what fillings you like. 1 Put crepe ingredients in order listed into the blender. Blend on medium to high speed, depending on how powerful your blender is, for 10 to 20 seconds. Scrape sides, and blend another 3 seconds. Cover and refrigerate for at least 1 hour or up to 24 hours. If batter has thickened, it may be thinned with a bit of milk or water (a teaspoon at a time) just before using. The batter (about 2 1/4 cups) should be about as thick as heavy cream. Tip: Or use an immersion blender in a 1-quart glass measuring cup, as I prefer; pulse until batter is smooth, scraping down the sides once or twice, about 20 seconds total. 2 Crepes can be made any size, but I use an 8-inch nonstick omelette pan or 8-inch nonstick fry pan to make 6-inch dessert crepes. Heat pan over medium-low to medium heat until thoroughly heated (droplets of water sprinkled onto the pan will sizzle and disappear immediately), about 2 minutes. Brush lightly with just a little melted or softened butter (I use the OXO Good Grips Silicone Pastry Brush). Here it is now, The Swirl: Holding pan off heat, quickly pour into the center of the pan 1/8 cup of batter, and immediately begin swirling, tilting and rolling, the pan until the batter covers the bottom of the pan evenly. Cook for about 30 to 60 seconds, or until browned on the bottom and looking dry on the top, especially the edge. Using both hands, lift the edge with your fingers and turn it over. The second side will need less time to cook. 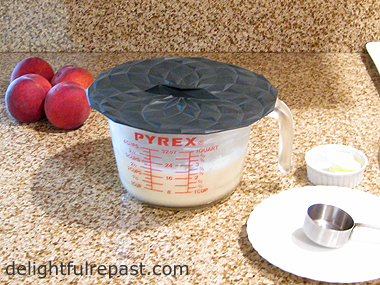 Tip: I use a 1/8-cup from my stainless steel measuring cup set. It is exactly the right amount to make crepes that are just a bit over 6 inches in diameter. And I use the GIR silicone mini spatula to start lifting the edge, then take hold of it with the thumb and index finger of both hands and quickly flip it over. 3 Repeat until all the batter is used. This recipe makes precisely enough batter for 18 crepes, but you will need to scrape the bowl to get that last 1/8 cup. Stack on a plate and store, wrapped, in the refrigerator until ready to use, up to 2 or 3 days; may also be frozen for up to 2 months. Let refrigerated crepes stand at room temperature for about an hour before proceeding. Allow frozen crepes to thaw completely before unwrapping and separating. 4 Prepare a dessert filling; in this case, fresh peach filling. You need only about 3 or 4 tablespoons of filling per crepe, and there are 2 crepes per serving. So do the math. If you are making dessert for two (that's 4 crepes), thinly slice enough peaches to make 1 cup or so. Add a squeeze of fresh lemon juice and sugar to taste; let stand at room temperature for about 30 minutes to macerate. You can even cook the macerated filling for 4 or 5 minutes if you prefer your peaches cooked. It's definitely the way to go when your peaches are less than stellar. 5 To assemble: Lay down a crepe, pretty side down (that's the first side cooked), spoon 3 to 4 tablespoons of fruit onto one half. Fold over other half to cover. 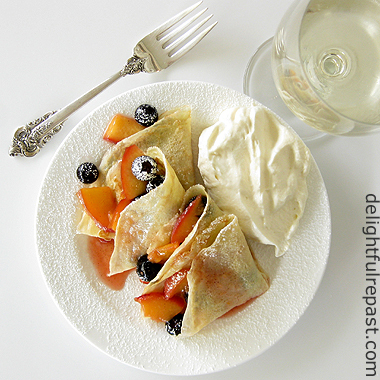 Fold in half again to form a wedge (that's the "Crepes Suzette fold"). Place 2 crepes on each dessert plate. Dust with powdered sugar and add a spoon or two of whipped cream. Crepes are one of my favorite and always have been! My mom first made them back in the '70s when I was a kid. I still make them today. And yes, they are so easy and always impressive for dinner guests. My recipe is not so different than yours except I use milk but no water. The blender works perfectly for mixing. One thing my mom use to make that I loved was what we called a crepe cake where she would layer a stack of freshly made crepes with a vanilla custard in-between each layer. Then top with fresh strawberries. Delish! That does sound delish, Richard! So many times crepe cakes are made with ooey-gooey chocolate, I'd much prefer the vanilla custard! You don’t remember your favorite DESSERT crêpes? Oh, dear, this is a medical issue! You must see a neurologist immediately to see if there is any damage to the lobe that records desserts (that’s the only lobe I have). As for the swirl, I’m reminded of the great ad that shows the alligator sitting at the table with some friends and he snaps up the offering on the plate next to him and wolf’s it down with his snout straight up in the air, and says with a smack, “Ooh…that’s good, crispy duck!” Now that’s a swirl. Sully, now there's an ad I'd like to see! "Good, crispy duck" is the *only* kind of duck to eat. I noticed you used the accent over the first e. I'm usually too lazy to hunt down and insert a "special character," but am impressed that you did. BJ, thank you! Do let me know how the recipe turns out for you! Yumm, Jean! It's been eons since I made or ate crepes! Probably in the 70's. As always you make it look and sound so great it's exactly what I want to make--today! Sue, thank you! Sounds like you're waaaaaaayy overdue for some crepes! It's been many, many years since I made crepes; perhaps as far back as my restaurant kitchen days. Sigh. I'm inspired now to introduce my omelette nonstick pan to these delicate, tasty as ever pancakes. And oh, the flavors and fillings running through my mind from sweet to savory. Yours are picture perfect, my dear. Bravo! Oh, Brooks, thank you so much! I'm glad I have six left in the freezer; it's nice to be prepared. Thank you for sharing this delicious recipe at the #RecipeSharingParty! I hope to see you next week. Pinned and Yummed. Please visit #OverTheMoon on Sunday or #ThursdayFavoriteThings for more sharing fun! Don't forget to Comment your link #'s so I can be sure to visit and you get a chance to be featured! Jean I love crepes and yours look fantastic. I too only have one non stick pan. :) Thank you for so faithfully joining us at Thoughts of Home on Thursday. You are a treasured blogging friend. They are so EVENLY thin and beautiful! Thanks for the tip, Jean. Your crepes look delicious, Jean.I enjoyed your discussion about how to pronounce, crepes.Over the years my family and I have hopped across the Channel to France on many occasions. I am not the greatest French speaker but I have a go. The French people appreciate that.They don't like it if you don't try to speak French. Thanks, Angie. I do so like to have the entire batch of anything to come out the same size! These crepes look outstanding. Beautiful! I never ever knew the correct way to say the word crepe. And the Magic Pan in Denver closed before I got a chance to go. Darnit. Pinning this one to try soon. Thanks for sharing Jean. Thanks so much, Lea Ann! Let me know how they turn out for you. I love the quantity of crêpes that your recipe makes - mine only makes seven or eight. I've tried doubling mine, and it was pretty disastrous. I'm not sure why. My favorite dessert crêpe is one filled with crème de marron (chestnut cream) topped with crème Chantilly! I first had them in Grenoble France, and love them to this day. I do remember the Magic Pan, as well. Such great memories of college meals there. David, I've never had the opportunity to try them with the crème de marron -- it would surely become one of my favorites! I had some savory crepes at a local French restaurant that were very bland. Lots of chicken, too much, and too much bechamel. And I thought how much better, and less expensive, the chicken divan crepes at Magic Pan were! 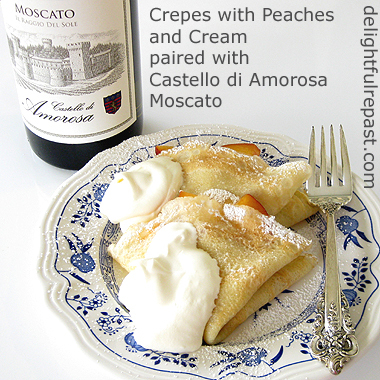 Thank you for the wonderful crepe recipe and for pairing it with our Moscato wine from Castello di Amorosa. I'm not sure I've ever done crepes or if I have it was so long ago. Thanks for the inspiration and good recipe. Breath holding on the flip! What beautiful photos of these luscious crepes! Thank you for sharing these with us at TOHOT! Thanks, Jim. I love figuring out wine pairings! Jemma, thank you! And thanks for hosting. Looks amazing!! I love your blog, so glad I found it! I'm finally back to blogging and I miss all the lovely recipes! Elizabeth, thank you! I'm so glad, too! Over the top delicious! I would love these for breakfast tomorrow. You are such a great baker and chef! Thanks for sharing and linking. Bernideen, thank you, you are too kind! For breakfast, I think I would have them with just plain unsweetened fresh blueberries and the slightest drizzle of real maple syrup. I love crepes, both savory and sweet, Jean! I use a blender to mix up the batter, for I don't have an immersion blender. Now, I'm craving some crepes! Kitty, a blender's great and I only recently jumped on the immersion blender bandwagon, so whatever works! But I'm in love with my immersion blender that came with a mini food processor/chopper bowl and a wire whisk that whips cream faster than a hand mixer or even a heavy-duty stand mixer. This is a special featured post on my blog today! Congratulations to you! Thanks so much, Bernideen. And I'm in good company with your other featured posts! I'm sighing over Michele's peonies right now! Hi Jean, Thanks for sharing at Wonderful Wednesday!! Your crepes look too good to eat!! Do you need a special pan to make them? And paired with Moscato...heavenly! If you have a moment, pop by our Friday Favorites Party at Must Love Home this week and share this amazing dish with us!Have a beautiful day - Hugs! Thanks! No, no special pan needed. Just a little nonstick 8-inch omelette pan (skillet with flared sides). I've been saying crepes incorrectly all this time?!? I haven't had crepes in a loooong time and now I'm craving some after seeing your yummy crepes. Thanks, Linda! I'll do that. As someone who is hopelessly addicted to sweets...I am drooling on my keyboard. Love those perfectly stacked crepes, drooling here, thanks for sharing with Hearth and soul blog hop, pinning and tweeting. Thanks so much, Swathi! Your pins and tweets are much appreciated, too! Thanks, Lucy! Would like to have a couple right now, but I don't want to break into my stash yet! Oh how I love crepes! But can you believe that I have never tried making them. These look so yummy! Thanks for sharing with SYC. Jann, if you love crepes, you *must* try this! Oh! I love crepes and haven't made them for much too long! I will have to give this recipe a try when our local peaches are ripe. Thanks for the recipe and the reminder of how good "kreps" are! Lily, I'm waiting for the peaches as well. The early peaches are never as good as the later ones. Thanks, Greg! And I'm glad you remember the Magic Pan, America's "crape-ery." What a delicious sounding recipe! I love peaches this time of year. My husband is quite the crepe chef, so we'll try this one soon. Carol, thanks, I'll check that out when I get a break. As you might well imagine, I'm hard at work in the Delightful Repast "test kitchen!" Appreciate your chef -- my husband does not enjoy cooking at all (but he's great at helping with the cleanup). I haven't thought of the Magic Pan in years. As I recall, their dessert crepes really weren't that good. But their main course ones were great. I keep an 8 inch nonstick pan just for making crepes. Although I'll do over-easy eggs in it, too (love flipping eggs; and of course I flip my crepes). Good post -- thanks. There's nothing like dessert crepes! I haven't made them in a long time, I probably make pancakes more often - but I'm so pleased to be reminded of this yummy way to finish a meal! Love the idea of pairing them with the dessert wine. Thank you for all the great tips on making crepes, Jean. I must try making them again soon and perfect 'the swirl'. Thank you for sharing with us at the Hearth and Soul Hop. Thanks, KR! I knew there was a reason I didn't remember their dessert crepes. I'll leave the flipping to you; I'm already in the habit of using my asbestos fingers to turn them! April, thank you so much! You and Swathi do such a wonderful job with the Hearth and Soul Hop! Your recipe is featured on Full Plate Thursday this week. Enjoy your new Red Plate and have a great day! Thanks so much, Miz Helen! And I'm going to make your Old Fashioned Coleslaw; it sounds perfect! Hello! Or rather, BONJOUR! Les crêpes à la pêche, quel délice! And no matter what language you say it, the taste I'm sure is DELISH! Anita, thank you so much! And I love hearing how someone found my blog. Jean, these crepes look delicious. Thanks for sharing the recipe! Thank you, Keri! My pleasure! 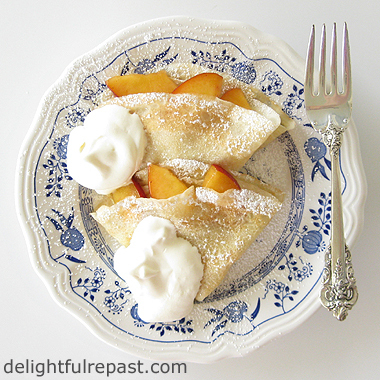 Jean y our crepes have been featured over at Sweet Inspiration. Come on by and get your button. And Congratulations. Mary, thank you so much! You have to know that I'm so fond of peaches and ... to be honest this recipe of yours seems fit for me ! Thank you, dear Dany! Peaches are the best! Have a wonderful weekend. A beautiful post and a delicious, easy recipe. I love peaches- this is making my mouth water. I popped over from TOHOT. Enjoy your weekend! Thank you, Tina, I'm so glad you like it! These are so beautiful! I will have to try and make them, especially with all the great fruit coming into season!